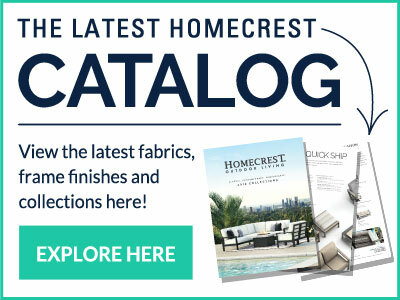 Yes, just visit a Homecrest Outdoor Living dealer near you. Click here to locate a dealer near you. You can purchase replacement slings, cushions and more at any authorized Homecrest Outdoor Living dealer. Click Here to locate a dealer near you. If the glass on my table top breaks how do I get it fixed or replaced? Currently Homecrest does not offer replacement glass, but you can find a local glass replacement vendor who can cut a new table top for you. We suggest 1⁄4" tempered glass similar to the thickness of many Homecrest table tops. It's also a good idea to get several estimates as prices will vary. While assembling my new Homecrest furniture I noticed that a piece was missing. How do I get a replacement piece? To obtain a replacement piece for your Homecrest furniture contact your dealer, as soon as you notice the piece is missing. In most cases the piece can be found at the dealer or they may even have a spare. You can purchase replacement straps at any authorized Homecrest Outdoor Living dealer. Click Here to locate a dealer near you. It's always a great idea to update your look when replacing slings/cushions, but if you only have one or two to replace you can always choose a complementary fabric to enhance the look of your set. Is touch up paint available? Yes, there are a number of touch up paints available. Check with your dealer to see what is currently available. Click Here to locate a dealer near you. After a long lifespan you may want to update or refurbish your Homecrest furniture, powder coating is a great way to refinish the metal components of your furniture. To find someone in your area that can powder coat your furniture or for more information go to www.powdercoating.org.